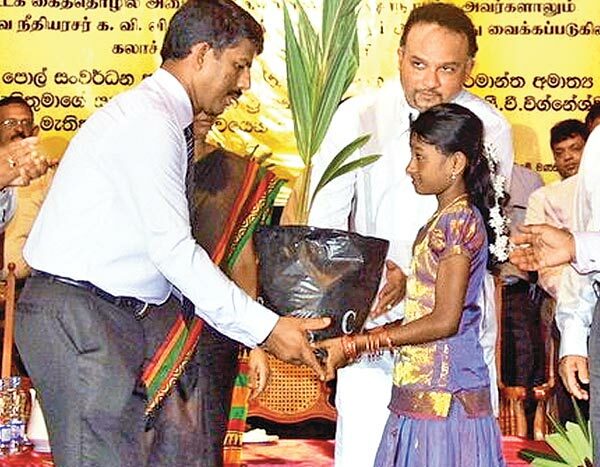 The first phase of the Coconut Triangle planned to be established in the North and East was launched by Plantation Industries Minister Navin Dissanayake on Saturday in Chavakachcheri. Under the special coconut cultivation programme in collaboration with the Northern Provincial Council over 18,500 acres of coconut land in the North will be rehabilitated and 25,400 acres will come under new coconut plantation. The progamme initiated by the Coconut Cultivation Board will be a joint effort with the Coconut Development Authority and the Coconut Research Institute of Sri Lanka and is scheduled to be accomplished in a period of three years. The total investment budgeted for the Northern Coconut Triangle is Rs 3,300 million in which the treasury will be providing Rs 650 million and the balance Rs 2,650 million as foreign investments. In a bid to increase coconut cultivation, the Plantations Industries Ministry had earlier disclosed that over to 80,000 acres will brought under coconut cultivation in the North East. Minister Dissanayake addressing the gathering at the Chavakachcheri Cultural Centre after launching the project on Saturday said the Government wanted to develop the North and East in rapid speed. That was one of the main reasons to establish the second Coconut Triangle of the country in the North and East and the project will be carried out with the consensus of the Northern people and their leaders, the minister said. Dissanayake also said the government had no intention in acquiring land which belong to the Northern people and deprive their rights but planned to create a big revolution through the Plantation Ministry in the peninsula. Dissanayake said that he very much understood the feelings of the Northern people who had lost their love ones due to the conflict as the Minister himself lost his father due to the same conflict. He said that they have now set a target of doubling the coconut production in the country with in a period of 10 years and to produce 3,600 million nuts in 2016 and Rs. 600 million has been has been already allocated by the treasury for the programme. By using the new offices, the government plans to issue over 300,000 coconut plants to the people in the North and this year they had received Rs 200 million for the North -East coconut development project, he said. Minister Dissanayake also visited the Palei model coconut garden where he laid the foundation stone for the Northern Provincial Resource Centre and also opened the Coconut Cultivation Board new regional office in Vavuniya. Pls start 'firing'; with these type of Good Projects than wasting money on Motor Vehicles. WHAT HAPPENED TO THE LAMBORGINIE'S OF NAMAL RAJKAPAKSE OF THE PREVIOUS GOIVT.?????? Excellent..., and much needed too. Following up Progress is far more vital. Keep it up.